I planted mine after watching a tutorial on how to paint the jars and plant them by my friend Allison. Here's a shout out to Allison. 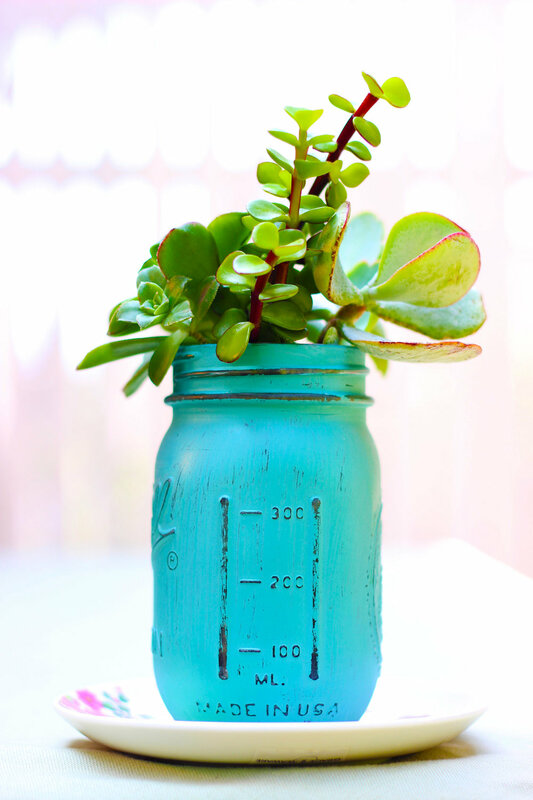 If you are painting the jar yourself, select a Mason Jar with writing, measurements, and a decorative design, so when you sand over those areas you will see them. You can display it on a decorative saucer. 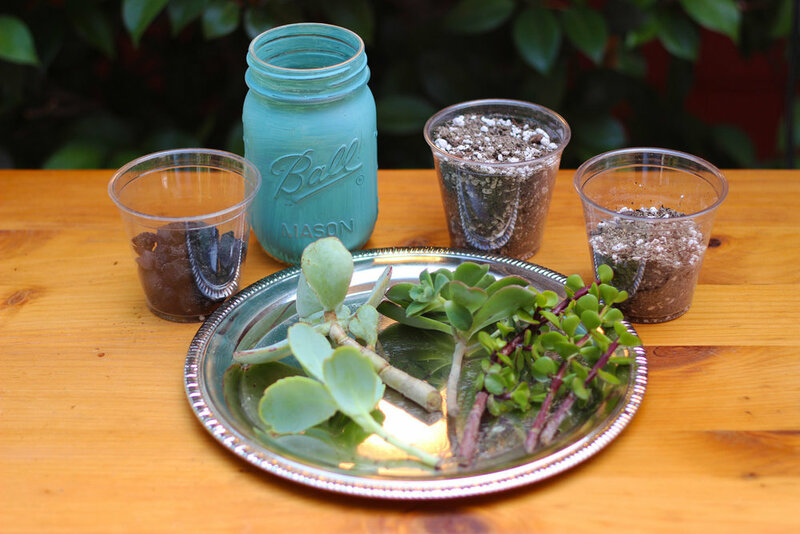 If you use succulent cuttings, let them sit 24 hours (out of direct sunlight) before planting. The broken charcoal promotes drainage, so you don't have too much water in the bottom of the container. (You don't want to roots to rot.) After watering, you can hold the plants and soil in place and tip the Mason Jar upside down to let excess water run out. OK, if you have your supplies and your chalk painted Mason Jar, then you are ready to begin. Here are your supplies and succulents. Pour 1/2 cup broken charcoal into bottom of Mason Jar. Pour 1.5 cups of cactus mix on top of charcoal. Pour in a little water. Push your first succulent in right back. Push your second succulent down on left with it hanging over the side. Place 3 vertical succulents at 30 degree angle from center, with shortest on outside. It may be helpful to use a chopstick to make a hole for the stem. Like so. Now plant your center succulent in the front. Here's the view from the left side with measurements in cups. The right side with measurements in ML. The deccorative back with a fruit motiff in a lacy oval. And you are done. Cool.